I received an advance copy in return for this honest review, thanks to Net Galley and G.P. Putnam. I expected to absolutely love it; I came of age when the South African revolution against the Apartheid state was in full flower and before anything about it showed on mainstream media, which was all we really had then apart from underground films shown in the basements of coffee houses near campus. I loved Mandela’s Long Walk to Freedom, and had attended dozens of talks given by members of the African National Congress that were forced into exile. So when I saw that this novel was set in revolutionary South Africa, I was pumped. Popular fiction about one of the greatest political events to occur in my lifetime? Oh yes indeed. Count me in! The novel has its strengths, to be sure, and those that have read nothing about the South African revolution may find this story more approachable than plunging into Mandela’s work, which requires hefty amounts of time and stamina as well as strong literary skills. Marais’s book showcases the inequalities that existed, a Jim Crow that was every bit as brazen as that in the southern USA during the early and mid-twentieth century. It highlights the institutionalized racism that forbade people of color from even entering white enclaves where the best of everything existed, unless the bearer was carrying a pass issued by a Caucasian employer. There are a lot of people out there, especially young ones, for whom this will be a worthy introduction. And it starts out strong, with convicts on the Parchman work farm in a setting so stark and immediate that it made me thirsty. That said, it also has its limitations. Our two protagonists are Robin Conrad and Beauty Mbali, in that order. Robin is a Caucasian child whose parents are killed in the struggle against Apartheid. Beauty is a Xhosa woman that is hired to care for Robin. Beauty’s own daughter took part in the Soweto Uprising and is missing. My disappointment with this book springs from the fact that Robin is given greater development, and in terms of physical space, nearly double the number of pages as Beauty (known to Robin as “Mabel”). A puzzling component is Robin’s invisible friend, whom she refers to as her sister. The invisible friend gets as much attention here as Beauty does, and for the life of me I cannot understand why. I don’t see the imaginary sister adding anything to the story. Given the setting, it’s also hard to understand why we need so much information about Afrikaaner culture. It feels a lot as if the author is saying that “All Lives Matter”. I know this book has a lot of happy readers, but I can only promote it in a limited sense. With the above caveats, this book—which is for sale now—is recommended for younger readers that have at least eighth grade literacy skills. I read this memoir, one of the most important of our era, before I was writing reviews. I bought it in the hard cover edition, because I knew I would want it to last a long time and be available to my children and their children. It was worth every nickel. It’s lengthy and requires strong literacy skills and stamina, but if you care about social justice and are going to pull out all the stops for just one hefty volume in your lifetime, make it this one. The first two or three chapters flow like molasses on a hot day. Mandela is laying his ground work, but it’s tedious at the start. Fight your way through it, because the story to follow–and we’re talking about the huge majority of the book here–is absolutely riveting, and in many ways is a tremendous lesson in struggle as well. Mandela is gone, but he is still a luminary figure in world history. In writing his memoir, some of which he did in prison, he was not following any publishing house’s advice about grabbing the reader right at the get-go. He didn’t need to toss in the usual teasers or follow a blueprint, because he was Mandela. An immensely articulate individual, an attorney before he devoted his life purely to the downfall of Apartheid South Africa, he was capable of telling his story brilliantly in many languages, and he did it. This autobiography chronicles Mandela’s life, first as the son of a tribal chief, then as an educated Black man under apartheid (a dangerous thing to be), then the journey, both outward and inward, from attorney to the leader of a revolution. You will read about his time on Riecher’s Island, the notorious prison, and the various experiences he had in the courtroom and in captivity. He tells of the cunning ways those who were jailed for political reasons created to communicate and to an extent, continue to lead from inside prison. And he breaks up the horror with an occasional vignette of a surprisingly kindly jailor or other authority figure who does small, decent things when no one is looking. If you are interested in the history of South Africa and the defeat of Apartheid, this is a must-read. If you ever, as I did, had a “Free Nelson Mandela” poster in your living room…read this, and celebrate. Zelda la Grange, an Africaner, grew up in South Africa under apartheid. Her family was steadfastly right-wing, and she was brought up to believe that Africaners were fighting against the “black communists”. She had been taught to fear them. The family servant, Jogabeth, was black, but she fell into a slightly different category, since she had a large role in raising la Grange while her parents, who were low income and struggled financially despite their white privilege, were working. But Jogabeth was not permitted to touch Zelda’s skin. When Zelda needed carrying, she climbed on the woman’s back, but already knew not to touch her hair, her hands. It might rub off. It might soil her. When she was finished with school, she got a secretarial position in the government, and it was there that she found herself working for a new president after the death of apartheid. She worked for Nelson Mandela’s personal assistant. White South Africa was in turmoil; some Africaners were progressive and welcomed the change, but her own family was outraged and frightened. La Grange needed her job and assured herself that because she was fairly far down the food chain, she would likely never actually see President Mandela. And the very thought of running into Black people in positions of authority terrified her. How much must they hate her and all of the Africaners who had kept them down for so long? Would they hurt her? And when the day finally came that she saw the president, she kept on moving, eyes averted, but he asked one of his staff to bring her in for a conversation. When she arrived, she burst into tears of mortification and fear. He took her hand, ending her lifelong habit of never touching a black man before she even realized what she was doing, and he made a point of holding that hand until he was ready to give it back to her. And in his kindly, genial manner, he told her, as she stood sobbing in terror before him, that she was overreacting. It would not be the last time he would tell her this. When I began reading la Grange’s memoir, I was initially disappointed. 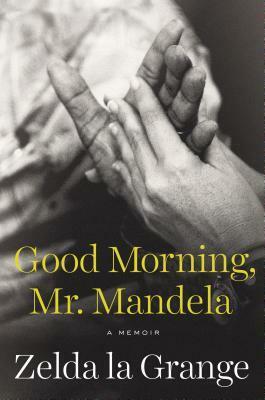 She spoke of her own life and told the reader that this was not Mandela’s memoir but her own. I didn’t want to read about the daily doings of some Africaner functionary. If I hadn’t received the book in exchange for a review, I’d have abandoned it, and it would have been my loss. Because soon after she found herself working for Madiba, her job became inextricably intertwined with his, and it continued through his retirement. Her life was, in many ways, his life. But because Mandela did not address his presidency when he wrote Long Walk to Freedom, and because he would never brag or dwell upon his own successes unless they were important historically, her story about life with him is different from his own. And because he would never name-drop, she does it for him. I reflected upon his choice of la Grange when he chose the entourage with which he would travel. He made a point of having a multi-hued staff around him, blacks, browns, golden toned and Africaner. She and a professor were the two Africaners he chose. So initially, he had just wanted her to be the Africaner who would represent her own race and culture on the new presidential staff. And it was a smart move. A man in his position must watch constantly for security risks. When choosing an Africaner for the staff, he needed not only someone who was organized, hard working, and competent—which she was. He also needed the least likely individual to be an assassin! La Grange describes herself as very young (I think she was short of age 20), but also shy and much inclined to blushing. Duplicity was beyond her. She also says she was plain looking and overweight. Madiba was a really smart guy. He understood that her youth made her more malleable than some, and that she was no part of anyone’s plan for a coup. In time she replaced his private secretary, and over the course of twenty remarkable years, she developed a steel spine as she became the gate-keeper to Mr. Mandela both during his presidency and after his retirement. La Grange has a lot of stories to tell. She traveled with Madiba to many places, and tells of his friendships with other members of royal families abroad, with celebrities, and with ordinary people. She also speaks of his tireless effort, even after the age of 80, to raise funds for clinics (especially for AIDS patients) and schools in what was still an underdeveloped nation. There was (and probably still is) a tremendous amount of corruption in government, but Madiba was completely clean, as one might expect, and made a point to keep his charity funds separate from those of the government. His travel abroad and frequent appearances sometimes caused political friction with those who succeeded him, who felt he had no right to speak for South Africa anymore; Madiba insisted he spoke for himself alone. And la Grange points out that it was the ANC that chose to make him the icon of anti-apartheid struggle, and thus they had no business complaining when international figures asked for Madiba rather than Mbeki or others who currently held office. There is a part I skipped through at the beginning that explains what apartheid was, and how it affected the lives of those who lived under it. I didn’t read it because there was nothing there I didn’t know; I was an anti-apartheid activist once myself. But for those who were too young to recall it or whose attention was elsewhere, it may help plug the gaps. But the vast majority of her story is of her life with Nelson Mandela. For two decades she was on the go, 24/7, and served at such a frenetic pace that she often could not take 20 minutes for a meal. The phone often rang in the middle of the night, and sometimes she worked all night long as well. Her transformation and dedication were complete. At the very end, a fracture within Mandela’s family formed, and a couple of his daughters decided that she could no longer see him, but she had been there for him right up until he was well into his decline. The memories she shares are ones you will find nowhere else; Madiba had attempted to write a second memoir, but was unable to complete it. And even had he done so, he would not have proudly told the world about the good that he did the way that la Grange does for him.